I was born in Seoul, Korea, but only lived there for a very short period of time. Though we left my birth country when I was 7 years old, my heritage has influenced the very core of my existence and has helped me shape my vision later on. This period of time was very crucial for my development and inspiration that I would tap into in my later life. We lived with my grandparents. My grandmother was a very devout Buddhist practitioner and would go to temple every week. I would tag along with her. I loved my grandmother and really enjoyed these moments with her. I also really enjoyed the temple. This temple consisted of mostly older women. I felt very nurtured and loved. I spent most of my time there in the kitchen accompanying the women who were preparing food for my Buddhist community. I would be told to make nori (thin sea weed, that I would have to salt and toast) and stuff dumplings. I felt with this I was part of something bigger than what was happening just right then and there, preparing food, but I was tapping into a legacy of women and Korean cooking and recipes that had been there before me for generations. It was a transmission of some sort and I was absorbing it all. During the holidays, new years, chu suk (Harvest time) and yearly memorials we would do for our ancestors, I would have to do the same thing. I would spend the time with my relatives, aunts and elders, and were put to work, preparing different types of traditional Korean cuisines. I wasn’t sure how long these traditions and recipes were around, but I felt that these were something so special that made me feel like I belonged and I felt nourished in my soul. As an adolescent and in early adulthood, living in New York, going to art school and pursuing a career as a curator, I had really forgotten about these deeply nourishing rituals as my life was often focused on more immediate gratifying passions. I found my rituals in adrenaline inducing sports. I spent most of my free-time pursuing outdoor passions such as riding motocross or surfing, training and fighting thai boxing. It wasn’t until I tore my labrum twice while surfing that I started to look for ways to heal and recover as I was no longer able to participate in any of the activities that I loved. In this search, I found my way back to my childhood, ritual and practice. As I was recovering, I started going to a Zen Buddhist monastery in the catskills which was so familiar from childhood, but so different as I approached this place as an adult. Now that I was no longer a child, I had to assume a larger role in monastery life. As a first step, I had to practice samu. Part of participating in the practice of zen, is not just meditation but also samu, volunteer work. Some of the work entailed very unglamourous things like cleaning the bathroom, cleaning the showers that were mildewed for years, cleaning out the sewage pipes, building a dam etc. Like many people, I didn’t care much for any of these things. It’s not that I felt the tasks were beneath me, but as I was looking for a place to aim my passion, these tasks did not meet the goal My sneaky plot to get out of these less than desirable work was to be in the kitchen. The kitchen work, I could do. I mentioned to them that I had some professional cooking training which was not entirely a lie, I had taken some classes at the culinary institute, then they put me to work. The work initially mostly consisted of washing dishes and cleaning vegetables. The food cooked at the monastery had to be both delicious and simple. The meals were similar to those of my childhood, focusing on seasonal produce and enhancing their flavor by using very little condiments. At meal time, you were given three bowls and chopsticks wrapped up like origami. The presentation of nourishment is as important as the food itself. Overall, food and its presentation could not distract from the overall purpose, but it needed to be a welcome respite for the monks. After assisting at the monastery for a few years, I was asked by the Abbot to take on the role of head cook. I had no idea why I was asked to serve this role and how I was going to be able to do this, but I realized that I needed to take on the challenge if the Abbot felt I was ready for it. I also felt that I didn’t have a choice. What I’d learned, from years of assisting, was that cooking was part of my spiritual practice. I had to be present for all aspects of cooking; from washing the vegetables, chopping, prepping to flavoring. For me, it wasn’t about following a recipe, but a heartfelt experience, a reckless abandon. Being present for the process, not the outcome. We had to be completely silent and ‘one’ with the food. In this process, I was able to really channel my past and the rituals that I experienced. By fortunate coincidence, during this process of creating recipes and cooking as head chef, I was also studying and attending Green medicine at the Open center, a holistically-based educational center. I was learning about homeopathy and herbal medicine. I started incorporating herbalism in my cooking while creating recipes for the monastery. The combination of these two activities ultimately led me to start Eir, a clean, natural skincare line geared towards people with an active lifestyle. After learning about the untapped benefits of many naturally occurring ingredients, combined with my training as cook for the monastery, I realized that there were no other beauty products on the market that had such a rigorous focus on the simplicity of nature. And like the requisite presentation of food at the monastery, I designed my packaging to reflect the quality of the ingredients within. As I began down the path with Eir, I was still recovering from injuries. The meditation practice was very strenuous and initially caused me pain, due to sitting for long hours. As part of the early days of Eir, I made ointments, balms and oils to help me with my pain management. As people learned of what I was doing, I started sharing my wares with the zen monks and practitioners who joined me at the center. These individuals meditated for hours or days at a time and were as much in need of my products as me. Beyond the pains of monk life, I learned that one of the nuns had burnt their hand pouring tea. I realized that I could make her an anti-inflammatory balm with Arnica and lavender that would help cure her pain. I assembled the balm in my room, and she came to me the next day and told me that the balm helped stop the pain caused by the burn. Word spread of my passion, and I was able to help others. I made a balm for cuts and the nuns would ask me for them so they could use this after they shaved their heads. Soon, the products I was making were becoming a staple item to those in the know in the monastery, including the head abbot. I realized that if I could bring such aid and relief to people living in a monastery, it was likely that others would be interested in my products as well. When I talk about the beginnings of Eir, I talk about the surf life, creating the products in my kitchen in Montauk. I have kept the trips to the monastery in between the months and the weekends because this practice has been something so personal and sacred to me and also have had difficulty articulating my spiritual experience. The experiences at the monastery, has always been compartmentalized as I feel I’m in a different world, a world where the mundane no longer matters. The fashion, Instagram followers, the live stories, the income, the success. It is an experience that feels so nourishing to my soul, a feeding of the hungry ghost that is inside me, that is inside all of us. I do feel truly lucky that I have found a place that provide me this feeling of home and nourishment. 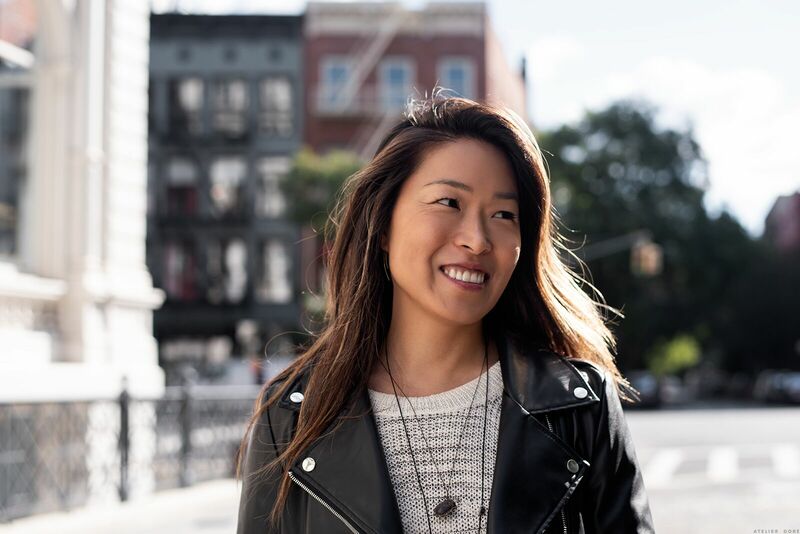 Jun Lee is the Founder of Eir NYC. For more info about the line and to check out the products, look here. She is an avid surfer and has become a student of green medicine. Follow along with her on Instagram, here! And you can find out more info about the monastery, The Zen Studies Society, here! Beautifully written. One of the most meditative and interesting stories Garance Dore has featured. Such an inspiring story! Thank you for kicking off the nourishment month with a great inspiration from Brooklyn! One of your best stories EVER! She’s inspiring and her story- contemplative at its core. Just wow…I wish I had such nourishment right know?? She is definitely so authentic because of her beliefs! Finding spiritual nourishment in NYC isn’t easy! Love the story and beautiful writing.